MFV Edinburgh returned from fishing on the morning of 12th March 2019. The two Sea Fishery Observers came ashore but the sea conditions weren’t suitable enough to backload fish or pump fuel. Back loading and fuel pumping started next morning. Passengers went on board the Edinburgh during the afternoon of 13th March and the vessel sailed for Cape Town at 6.25pm. Passengers are: Islanders: Lars & Trina Repetto, Elizabeth Rogers, James, Felicity and Kieran Glass; Others: Stefan Van Wyk, Carmen Ferreira, Jan Bradley, Kyle Gordon, Gianfranco Repetto and David Moores. MFV Edinburgh was able to start offloading cargo on Monday 4th February 2019 as sea conditions allowed use of Calshot Harbour to receive the raft and barges. This started with offloading of medical supplies, fresh fruit and vegetables. Unfortunately, the entire fresh consignment had to be condemned, partly owing to the fact that it had been on board since mid-January. Luckily MFV Geo Searcher arrived later in the week and was able to offload its own more modest cargo of fresh fruit and vegetables which are now being enjoyed by island families. Edinburgh offloading continued until late evening on Friday 8th as the vessel carried essential spares for for the crane which took time to be brought ashore. This is part of a 350,000 Euro upgrade to this vital piece of infrastructure. Without it we cannot launch the rafts for offloading or place the concrete blocks (dolos) to maintain the integrity of the harbour. The ship sailed for seamount fishing at 20.00 on 8 February and is scheduled to return to Tristan in about three weeks for the return trip to Cape Town. MFV Edinburgh developed a technical fault on Sunday 20th January four days out of Cape Town and over half way of the 1750 miles to Tristan da Cunha (you will often hear it is 1500 miles - but this refers to nautical and not statute miles - for extra clarity the island is 2810 km from South Africa). Therefore the vessel turned around and arrived back in Cape Town harbour early on Thursday 24th January. Repairs were carried out promptly which enabled the vessel to depart again on Friday 25th January at 13.00. The ship made good progress and arrived at Tristan at 16.45 GMT on Thursday 31st January 15 days after the ship first left Cape Town on 16th January. Craig Bergh (Ovenstones). Dr Jack Dascalu, Conservation workers Carmen Ferreira, Jan Bradley and Kyle Gordon, Crane Technician Stefan van Wyk, Vet Aniket Sardana, and visitor Gianfranco Repetto. 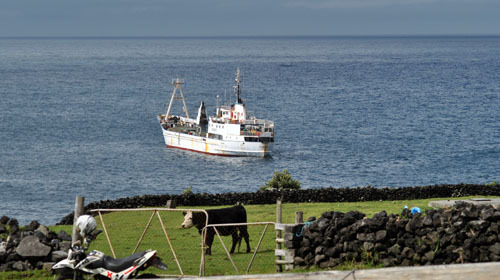 The delayed arrival of the ship on Tristan is particularly disappointing for the island community as it is the first scheduled sailing to Tristan da Cunha in 2019, carrying the first incoming post and 'fresh' foodstuffs since the last arrival of MFV Geo Searcher on 18th November. Off loading was not possible on Friday 1st February, so the crucial cargo remains aboard the ship. There are 10 scheduled Cape Town - Tristan - Cape Town trips every year, but they are not spread out evenly, with three arrivals in about three weeks late August - early September and always a two-month gap over Christmas and New Year. MFV Geo Searcher departed Cape Town on Thursday 31st January, the day MFV Edinburgh arrived at Tristan. So there will probbaly be two arrivals within a week. A bit like the old story about London buses: have to wait a long time for one to arrive, then two turn up! Craig Bergh (Ovenstones). Dr Jack Dascalu, Conservation workers Carmen Ferreira, Jan Bradley and Kyle Gordon, Crane Technician Stefan van Wyk, Vet Aniket Sardana, Bishop Geoff Davies and Kate Davies, Visitor Gianfranco Repetto. Unusually, no Tristan Islanders are travelling on this trip, but it is good to see a member of the world-wide Repetto family making a trip to the island to meet distant relations.